My hair desperately needed a new style and Nicole did a fantastic job. I have wavy/curly hair that had fallen flat and Nicole's cut brought it back to life! She even showed me how to style using the Devacurl method and I kept getting compliments! Overall, service is great. Super friendly, clean, and organized. First time customer and will be a returning customer. Cute salon with great customer service. My stylist Hector gave life back to my hair! Exactly what I wanted! "Had an amazing experience & fell in love with my hair again. Met new lovely & talented ladies, plus I got to see familiar faces!" "Cathy and her crew are not only talented but also kind and a joy to see every time I need a trim. You simply couldn't ask for more!" "My entire experience here was honestly one of the best I've ever had at a salon. I was late to my appointment because of traffic, but when I got there I was greeted with kindness and no remarks to my tardiness. I got my super curly hair blow dried and straightened by a very nice and patient girl named Lilit. She was gentle yet knew how to deal with African-American hair without basically attacking it like most people do. I over all had a great experience and will be coming here again :)"
She was very nice and took a few minutes to ask me if there was anything specific I wanted for my blow out. She got started and was actually done in about 30 minutes which I was pleasantly surprised by. When I looked at my hair it looked great! I was really happy with how much volume she gave me and that I could still run my fingers through my hair. Parking was a bit of a hassle so just give yourself some time to find a spot. I would definitely come in to see Brie for a blow out again." "I'm a big fan. I've been in twice to see Bri, who is so sweet. Having curly hair, it can be super hard to find a good stylist, especially when you only want to use CG friendly products. Anyway, I feel like I've really lucked out and I'm very happy with my cut and color!" "I don't normally make reviews on places and I'm a very picky person who has moved around a lot and gone to a lot of hair dressers and awful ones too boot! Danielle was wonderful and I love the Deva process! If you wear your hair curly it's the best process and products! I still love my old Bumble bumble product but I'm excited that there is another product out there to match or exceed it :) thank you so much!" 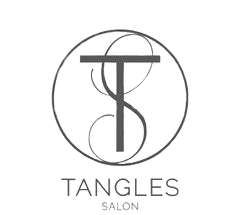 "This salon is fantastic, first time @ Tangles Salon a friendly welcoming experience. I can LOVE my hair again! I met w Julie Varela who took wonderful care of me. Julie did a brilliant job at coloring and mini balayage her techniques were very good. She's was efficient, sweet & easy to have a conversation with. Definitely considering being a regular. Julie is a true hair genie!"